My main goal is for all groups to have their sentences written down with a picture. Since I know some groups will finish faster, I have listed extensions that I want them to complete. Above is what I have posted during the activity. Usually once the last group has their sentences and in order, I bring everyone together to discuss and correct. I never grade these, but they are great practice for a small assessment that they may have before leaving or the next day. In my slideshow, I have them transition in one by one, so we can have groups volunteer the correct order and correct and discuss together. Many of these are too much work for me with 4 preps. If you have more time and can focus on one class, these would be a way to mix it up. If you have others let me know and I will add them! 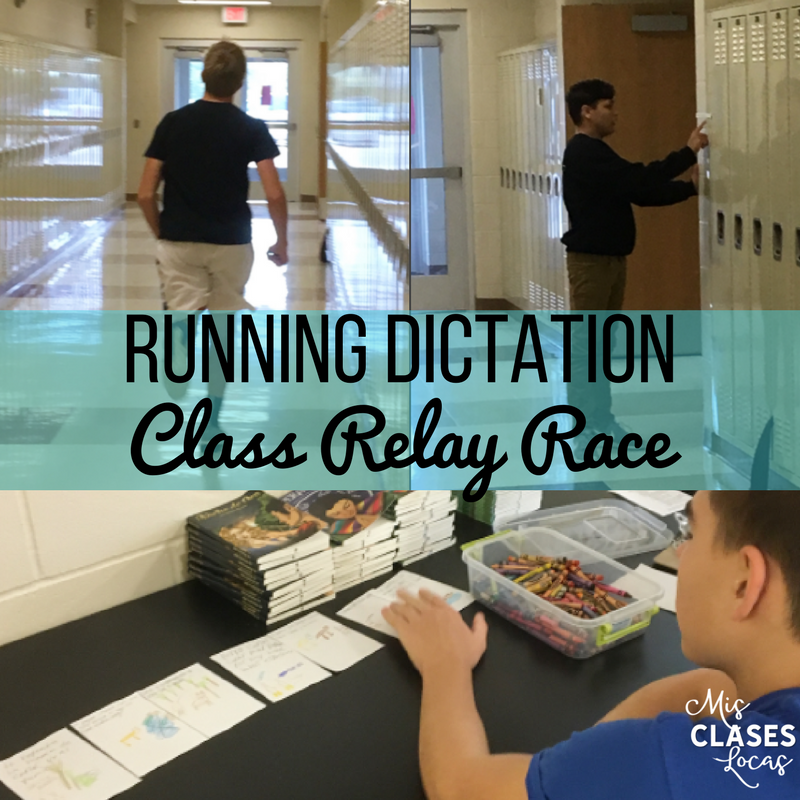 Do the activity outside or in a gym like an actual relay race, running in lines back and forth. Post the sentences and pictures that groups create from the activity and use them later as a gallery walk. Most classes love this activity and the chance to move. The early morning classes sometime complain to start, since they are not ready to wake up, but this is a nice way to force them all to engage. I actually had a formal observation during running dictation and my principal loved how everyone had a job, there was high engagement, extension were provided and students used a variety of skills to complete the activities (reading, listening, writing, cooperative group work etc). Like everything, you do not want it to get stale by doing an activity too much, so I usually only complete it once per novel, or about once per quarter. 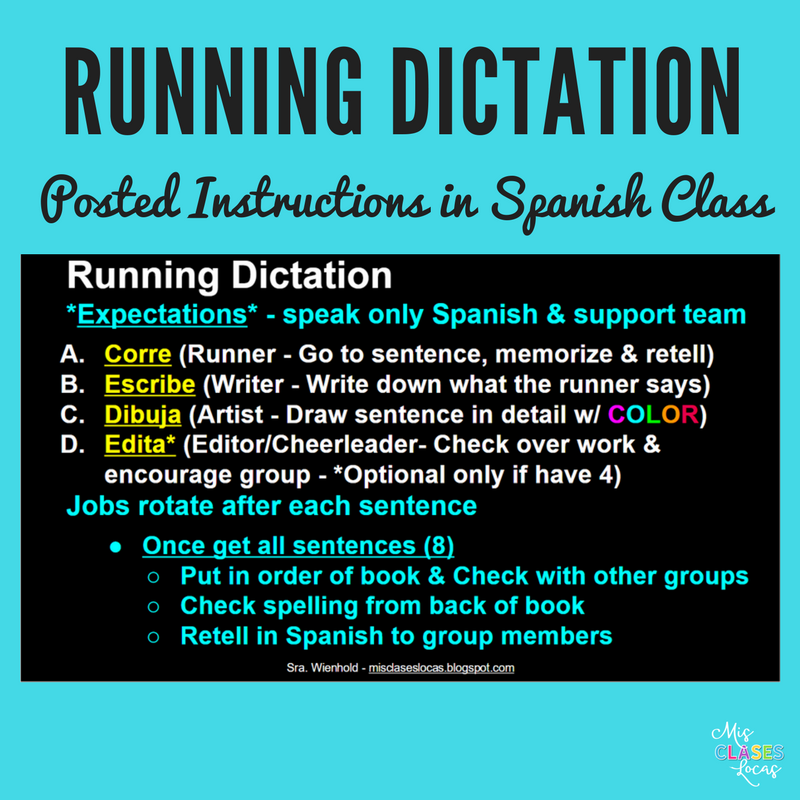 Do you use Running Dictation? Please share your version!